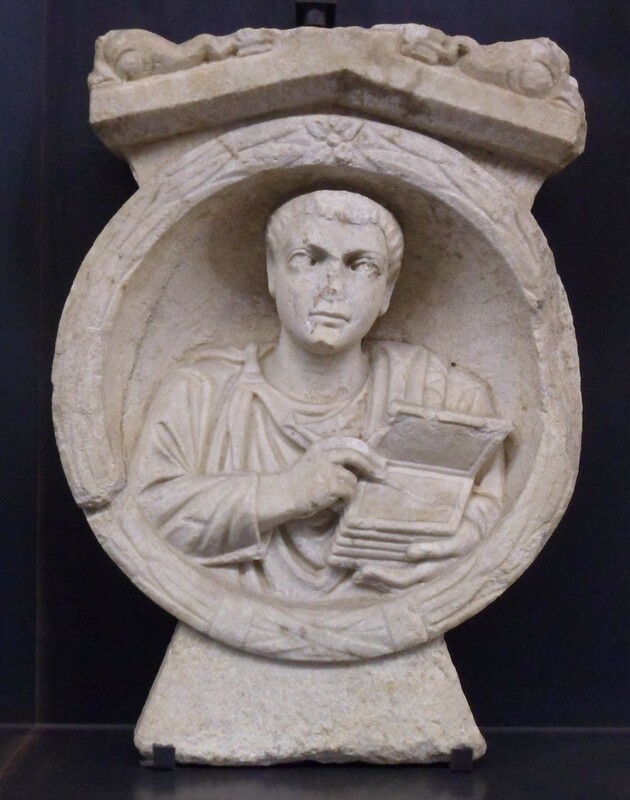 A tomb relief depicting a man in a toga with six writing boards, Archaeologisches Museum, Schloss Eggenburg, Graz. Photo by Sean Manning, September 2015. Suetonius, Divus Julius §37: Pontico triumpho inter pompae fercula trium verborum praetulit titulum VENI·VIDI·VICI non acta belli significantem sicut ceteris, sed celeriter confecti notam. In the Pontic triumph among the litters of the parade was a label of three words I CAME – I SAW – I CONQUERED, not a description of the events of the war like in the other triumphs, but a reminder of how quickly it had been finished. A bit earlier than that, Darius the son of Hystaspes faced a similar problem. Darius the king speaks as follows: Not only did I kill Gaumata the Magus, but after that there was a man, Atrina was his name, the son of Upādaramma, a man from Elam; he made an uprising in the land of Elam, he spoke as follows: ‘I am the king of Elam!’ After that the men of Elam became hostile and went over to this Atrina. He became king of Elam. Not only that, but there was a man Nidintu-Bēl, the son of Kin-Zeri the royal secretary; he made an uprising in the land of Babylonia. He lied to the people-in-arms as follows: ‘I am Nabu-Kudurrī, the son of Nabonidus, king of Babylonia.’ The people-in-arms which was in Babylonia went over to him. Babylonia became hostile. He seized the kingdom of Babylonia. Darius the king speaks as follows: After that I sent a son of the sending. They seized this Atrina and sent him before me. I killed him. Darius the king speaks as follows: I went to Babylon and came head-to-head with this here Nidintu-Bēl who lied as follows: ‘I am Nabu-Kudurrī.’ … (the story of how Nidintu-Bēl was defeated, captured, and executed fills three long paragraphs and is followed by stories about seven other revolts and their suppression). Darius’ scribes did not think of a way to alliterate like Caesar’s did, but they managed to use one word šapāru three times in three sentences. And whether we see their patron as a hero or an usurper, I think we can rightly admire their cunning. (All translations are my own; I thank Robert Rollinger for pointing out the wordplay). Who writes the history books? Michael Ignatieff, former head of the Liberal Party of Canada, has been musing about why he lost the election of 2011 (see eg. this excerpt from his book in the Toronto Star). One of his consolations is that succesful political thinkers often fail as practical politicians, because theory and practice are different arts and require different virtues. Canadian readers will have their own opinions about Ignatieff’s career, and I don’t expect that anyone else cares, but this has reminded me of the curious idea that history is written by the victors. It seems to me that this commonplace is more misleading than helpful. It is certainly true that the victors sometime write the history books. For example, we know little about many ancient sects, because after they died out nobody preserved their sacred texts or their doctrines. Augustus and his supporters conducted a magnificent propaganda campaign against their enemies Marcus Antonius and Cleopatra, and little of their own perspective survives, so that historians who wish to tell their story need to wield all their powers of imagination. In these cases, the defeated side died out and its story died with it. Yet other times, each side preserves its own story. Plutarch and Appian are rather sympathetic to the Gracchi brothers, even though they were killed and their political programs were violently supressed. Although more than two hundred years had passed between the careers of the Gracchi and Plutarch’s and Appian’s writing, some pro-Gracchan stories clearly existed and could still win converts. French victory in the Hundred Years’ War did not make the English stop telling stories about their three great victories and their warrior kings. And because the War of 1812 ended ambiguously, both Canadian and American patriots have been able to use it to tell cheering stories. Canadians often remember the siege of Detroit and the sack of Washington, Americans the Battle of New Orleans and the exploits of their navy. Most interesting are the times where the victors busy themselves with ruling, while the vanquished sit and argue with themselves about how they could have lost or why the defeat was not really their fault. Consider Xenophon the Athenian. He was born an Athenian knight (hippeos), grew up while his class suffered a series of defeats as they tried to seize power from the faltering democrats, and saw Athens defeated by Sparta and forced to give up its walls, its fleet, and its empire. He then left Athens for Asia Minor, where he joined the army of Cyrus the Younger, who tried to become king but was killed. Xenophon and part of Cyrus’ army fought their way back to the Aegean coast, where they joined a Spartan army which was campaigning in Asia. After a few successful campaigns, the Spartans were forced to retreat to Greece, and Xenophon followed them and was granted an estate in the Peloponnese. He lived well for several decades until the Thebans overthrew Spartan hegemony. He was driven from his farm and settled in Corinth until his death. Xenophon and his friends were defeated again and again. Yet he devoted a great deal of time to writing, and the stories which he tells dominate our view of Greek history from say 411 to 362 BCE. Ancient and medieval readers loved Xenophon’s literary style and his aristocratic values, so they preserved his writings and accepted his stories, and because Xenophon’s version is often the most vivid and detailed which survives, modern writers tend to be strongly influenced by him even when they acknowledge that trusting him is risky. If it is skillfully written and says what they want to hear, people often accept history as written by the vanquished. Often, each side composes a story which makes it happy and tries to ignore other versions. Professional historians can’t control the sources which are passed down to them, but they can search out as many versions as possible, consider the perspective and limitations of each, and try to be fair. If the results are not perfect, neither are they a simple repetition of the victor’s point of view.